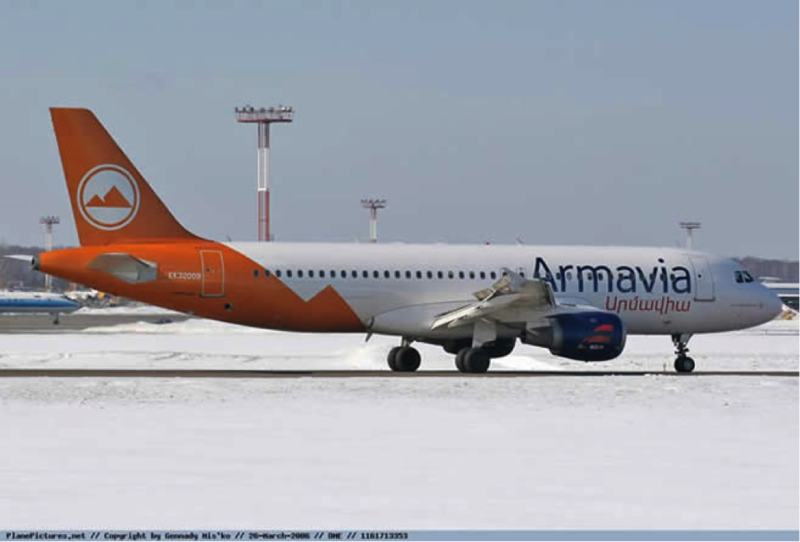 In the early hours (01:40 Armenian time) of Wednesday May 3, 2006 (20:40 UTC May 2, 2006) Armavia Airlines international scheduled flight RNJ-967 took off from Zvartnots International Airport in Yerevan, Armenia destined to Sochi, Russian Federation. After 93 minutes of flight at 22:13:03 UTC May 2, 2006, Armavia 967 crashed into the Black Sea 4 miles southwest of Sochi runway, killing all persons aboard, 105 passengers (100 Armenian, 4 Russian and one Ukrainian) and 8 crewmembers all Armenian nationals. Not surprisingly, most “reports” and “expert analysis” which appeared in the media shortly after the accident, indicated pilot-error as the only possible cause of the accident. However the AAIC-MAK report also concluded that the accident was caused because both PF (Pilot Flying) and PNF (Pilot-Not-Flying) failed to apply sufficient and adequate pitch inputs to arrest the aircrafts’ loss of altitude and thus prevent the impact with the sea, due to lost or degraded Situational Awareness (SA). In the meantime, in the weeks that followed the accident long before any cause of the accident had officially become known, ARMAVIA officials made repeated public statements in which they declared their will to fully compensate all victims’ families by international standards. Unfortunately these statements were deceptive. Instead all ARMAVIA cared for, was to prevent families from obtaining independent legal advice and so learn their proper rights. Within July 2006 and while relatives had not recovered yet from the shock and devastation, ARMAVIA and their insurers in Armenia, induced the families to accept the ridiculously low sum of USD $ 20,000 per deceased passenger as total and full compensation. ARMAVIA then declared that this sum was the proper international standard of compensation and stated that they had no more liability. At this stage we had no involvement in the case. Only some months later and because the father of the late co-pilot Armen Davtyan-a retired pilot himself- refused to accept that the crash was exclusively caused by pilot-error, Mr and Mrs Davtyan retained our firm first to investigate the accident and help them find the truth for the loss of their beloved son and then seek proper compensation. We started working in December 2006 and eventually were retained by the families of 75 deceased passengers and crewmembers, Russian and Armenian. Our task was first to investigate the actual causes of the accident and then to file lawsuits before competent Courts in order to seek proper compensation for the victims against ARMAVIA, who shamelessly misled all victims to believe that their compensatory rights were limited to USD $ 20,000 per passenger and then against any other responsible person. The fatal aircraft was a A320-211 type jet manufactured by Airbus Industries SAS, Toulouse, France with MSN #547# and flew its first commercial flight in 1995. Before entering the Armenian registry in 2004, the fatal aircraft was leased for 6 consecutive years and operated by Ansett Australia registered as VH-HYO with the Australian registry. After the Australian airline operator went bankrupt in 2002, the aircraft (November 2002) returned to France re-entered the French register as F-WQSB and remained stored in hangar until February 2004 when its owner, FUNNEL (Cayman Islands), leased it to ARMAVIA. Under the operation of ARMAVIA the aircraft was maintained by “SABENA TECHNICS SA” in Brussels Belgium. Just 73 seconds before crashing, at 22:11:49 UTC, Armavia 967 was flying in landing configuration at 1280 ft altitude (390 meters) (landing gear extended, CONF FULL) established on the glide scope, just 5km (2,6 nm) from the touch down point, and pilots had most probably established visual contact with runway lights. Unfortunately at that time, the crew were unexpectedly ordered by the Russian ATC to climb at holding pattern altitude 600 meters (2000ft) and to start a new approach for landing. From that moment and within very short time a safe and until then under control routine flight, became a major accident, claiming the lives of 113 people and devastating the lives of those left behind. When Airbus entered the A320 type of aircraft in service in 1988, it revolutionized the industry by introducing extensive application of sophisticated computers in the cockpit, which largely took over a significant amount of pilot work load. Computers were used before in the cockpit but in the A320 computers were no longer to provide secondary help to the pilot. They actually took over the control of the aircraft. The most characteristic such computer application is the “Fly-By-Wire” (FBW) flight control system. The main idea of the FBW system is that conventional pilot’s “yoke”, the steering wheel device by which each pilot used to mechanically directly (through hydraulic servomechanisms) control the movement of pitch and roll flight control surfaces on the aircraft’s tail and wings (elevator, horizontal stabilizer and ailerons) has been exchanged for the side-stick, a small lever positioned on the side panel left for the captain (to be operated by his left hand) and right for the flying officer (to be operated by his right hand). Each one of the 2 side-sticks is linked to a computer, named Elevator Aileron Computer (ELAC). Deflection of the side-stick by the pilot in an omni-directional (360° ) mode from its center neutral position, transmits electronic signals to the ELAC which the later processes and interprets into moving orders through hydraulically activated servomechanism of the pitch or roll control surfaces on the aircraft’s tail and wings. So aside from the fact that the side-stick is much more concise and positioned on the side of each pilot as opposed to the central position of the conventional control column, the intervention of the ELAC computer between pilot’s command and actual control surface movement is the difference between FBW and classic (conventional) control system. The two side-sticks are not coupled mechanically and they send separate sets of signals to the flight control computers. While each side-stick is equipped with a priority over the other side-stick take-over button, simultaneous control input by both pilots is possible and quite common. In the event of simultaneous input on both side-sticks (2 degree deflection off the neutral position in any direction) two green SIDE STICK PRIORITY lights on the glare-shield come on and “DUAL INPUT” voice message is activated. The visual “DUAL INPUT” announcement system, i.e the illumination of a GREEN light on the glare-shield panel, is not appropriate and effective in warning or alerting the pilot for a potentially extremely dangerous situation and is contrary to the color philosophy of AIRBUS (and all aircraft manufacturers and cockpit designers), which philosophy follows the principle that GREEN is the light indicating normal operation and is never used to attract pilots attention. The same illuminating pushbutton is used to announce side-stick priority when the take over button is used and illuminates to announce to the pilot 4 other situations, besides when simultaneous dual input situation is occurring. The matter gets worse because the same button will in some circumstances illuminate red, in other red and in some cases half red and half green!!! It is difficult to design and implement a more complicated and confusing system of warning. No wonder no A320 pilot (at least in cases documented over 20 years) has ever used the side-stick priority take-over button. Apart from the above totally ineffective and rather confusing illumination visual announcement system in the event of simultaneous side-stick input by both pilots an audible “DUAL INPUT” aural warning in the form of synthetic voice is heard in the cockpit and is repeated every 5 seconds. However as it was tragically demonstrated in the Armavia 967 crash “DUAL INPUT” aural warning in complete disagreement with the contradicting FCOM provision was inhibited during the EGPWS aural alarm activation. While the aircraft is on the ground side-stick indications like a cross appear on the PFDs in white color. Such indication provides immediate, clear and reliable information to both pilots as to the position and inputs of both (combined position indicator) the side-sticks and permits the pilots to gauge the intended deflection of the side-stick. However such indication (white cross) disappears as soon as the aircraft becomes airborne. According to leading European A320 operator training manual this indication is useful during take-off and helps pilots to measure their side-stick input in this phase and while the aircraft is on the take-off rolling. There is no reason why pilots should be deprived from this indication during the flight. On the contrary the crew is left with less information regarding the most important control lever status, although it would be technically feasible, absolutely possible and desirable to continue to have the side-stick position indication on the PFDs throughout the flight. In this regard in order to emphasize AIRBUS’s obligation to having considered the appearance of the white cross on the PFD through the flight, it should be noted that the aircraft’s design philosophy is during emergency situations to maintain at all cost the PFDs (even in the event of loss of all others cockpit display units). Accordingly if side-stick indications appeared there it would certainly eliminate the serious shortcomings of having the aural warning “DUAL INPUT” inhibited as above. The FCOM and/or other relevant guidance manuals relating to both A320 and the EGPWS do not contain the critically important information that when the GPWS aural warnings are heard, the “DUAL INPUT” aural warning is inhibited. In view of the circumstances which usually trigger the GPWS aural alarm, it would be critically important for the PF to know positively that his pitch control inputs are not being impaired or totally contradicted by the PNF who most probably will be using his side-stick also when the GPWS alarm is heard. Therefore while the inhibition of the alarm in the first place is bad, the omission of the FCOM to inform pilots of the “DUAL INPUT” aural warning inhibition at the time when the GPWS warning is heard, is double deadly because the PF, not hearing the “DUAL INPUT” aural alarm is left with the erroneous illusion that there is no “DUAL INPUT”. In view of the demonstrated inefficiency of the design of the side-stick control system to positively and under all circumstances competently warn pilots whenever DUAL INPUT takes place, the design philosophy of having two separate and simultaneously acting control levers, which can contradict one another, renders the aircraft’s control problematic. The reason of having two pilots in the cockpit is not because the one is spare and will take over when the PF is incapacitated. On the contrary both pilots should participate with different task throughout the flight, although it would be possible in an emergency for one pilot to control the aircraft alone. Having two pilots reduces at least by half the possibilities of an accident due to loss or degradation of situational awareness. Because it would require 2 pilots to suffer SA before the aircraft enters a phase of loss of control. The shortcoming of the design of the A320 DUAL INPUT system as analyzed above, puts the aircraft in unavoidable loss of control situation as soon as only one pilot suffers loss or degradation of SA. Because his erroneous and undetected by the other pilot side-stick inputs will not only immediately affect the performance of the aircraft, but will simultaneously cause confusion leading to degradation or loss of SA to the other pilot, because the latter will not be in a position to determine why the aircraft is not responding as anticipated to his control inputs. The French BEA comments on the IAC Report very accurately highlight this grave design defect. Flight manuals and associated cockpit literature claim that the computer managed flight system gives complete protection against excursions outside the normal flight envelope and greatly improves the man/machine interface. However contrary to this “complete protection” claim, the A320 while in normal law, where supposedly no inputs are necessary to maintain current flight path, can lose thrust and as a result the LOW ENERGY warning will be triggered to alarm pilots that thrust increase is necessary to recover a positive flight path angle through pitch control. Then while the computer will engage (A/THR) and apply automatic thrust increase, the pilot has no clear indication the system is taking over. This leads to failure on behalf of the pilot to appreciate that the aircraft as part of the automatic response to the LOW ENERGY, will limit the nose-up attitude and impose a climbing vertical speed reduction in order to allow for the speed increase. In OPEN CLIMB MODE and while Automatic Speed mode protection is engaged the pilots will hear the same aural warning (CLICK, CLICK, CLICK) for 4 completely different contingencies, whereas each different warning would announce totally different automatic re-actions by the flight protection computers. In particular triple CLICK can be heard (1) when the aircraft has lost speed and the computer increases thrust to accelerate speed, (2) when the aircraft is flying at overspeed the computer reduces thrust to decelerate speed, (3) when the aircraft in climbing exceeds the set altitude target the computer decreases vertical speed and (4) when the aircraft in descending falls below the altitude target and the computer decreases the vertical speed. One of the most important indications is the FMA (Flight Mode Announciator). The reason is that according to the flight mode applicable each time, the pilot should alter his control inputs and the aircraft automatic flight control will respond differently. Therefore if for any reason the flight mode changes and the crew fail to notice such change, the situation may develop to loss of SA. The FMAs on the PFDs does not correspond to the importance of the information they transmit because there is no changing color philosophy and no aural announcement of the flight mode audible to both pilots every time there is a flight mode change. Accordingly it is very easy to be confused with relation to the flight mode engaged at any time. The A/THR pushbutton illuminates green both when the A/THR is armed as well as when it becomes active. However since the two above situations differ as while in the former there is no automatic thrust computer induced movement, in the latter the computer applies automatic thrust increase or decrease, the pilots have no visual or other indication when the computer actually applies thrust control input. This absence of information together with the already reported design defect that the thrust levers do not follow the computer ordered thrust increase or decrease, lead to full confusion as to when and if thrust is being actually controlled by the computer. When AOA (angle of attack) is active, the THS setting is limited between the setting at the aircraft’s entry into this protection and 3,5 degrees nose down. Neither the pilot nor the system can apply additional done-up trim. Such limitation is seriously impairing, if not canceling altogether the possibility of an aircraft which for whatever reason is descending in an excessive vertical speed which would automatically activate AOA, to recover through full aft side-stick application as specified in the FCOM as the recommended reaction to GPWS alarm. A320 Flight Crew Training Manual expressly provides that “Flight with Gear Down, Performance is severely degraded. Consider the effect of terrain on the planned departure route and the GO-AROUND due to poor climb performance. Common Errors: Lack of awareness of severe performance limitation”. In view of (i) the known to AIRBUS severe performance limitations when flying at low height with extended landing gear and (ii) the acknowledgement contained in the FCTM that crews commonly underestimate the performance limitations of the A320 when flying with extended landing gear, AIRBUS immediately after the Bahrain Gulf Air 072 fatal crash on August 23, 2000, where the pilots during the GO-AROUND maneuver had not retracted landing gear, should have issued a warning to be included in the GO-AROUND procedures in the A320 FCOM by which pilots would be prohibited to execute GO-AROUND without retracting landing gear. Had this been done since 2000, Armavia 967 would not have entered into the same dangerous situation if landing gear had been retracted as a result of a mandatory action imposed by the FCOM. It is important that investigators of the Bahrain Gulf Air crash recommended to ICAO to impose a prohibition of non standard GO-AROUND procedures. Russian AAIC-MAK report makes particular note to the fact that DUAL INPUT aural warning was inhibited as soon as GPWS alarm sounded and also points to the fact that such inhibition was not known to pilots and probably was fully appreciated by AIRBUS engineers during the simulations executed in relation with the investigation for the Armavia 967 crash. In order to fully understand the immediate and critical consequence which the inhibition of the DUAL INPUT aural warning had in the development of the accident, it is very important to note that as shown during the simulations executed at AIRBUS installation in Toulouse, Armavia 967 entered into a non-return condition only 5 seconds before the impact with the sea namely at 22:12:58 UTC (the impact occurred at 22:13:03). The EGPWS aural warning, which inhibited the DUAL INPUT warning started to sound at 22:12:41. Accordingly for 17 useful seconds (from 22:12:41 to 22:12:58) the PF due to the aural warning for DUAL INPUT having silenced, was deprived of the critical information that PNF was deflecting his side-stick. At the same time during those important 17 seconds PF was additionally distracted and further confused and loaded with the false and distressing illusion that the aircraft was not reacting normally to his control inputs, since he did not know that the DUAL INPUT aural warning was inhibited and on the contrary had formed a right in the view of the defective FCOM, but erroneous in reality, belief that the PNF was not deflecting his side-stick. In 2008 acting on behalf of the families of 75 victims we filed lawsuits before Toulouse Courts in France against AIRBUS SAS. In such lawsuits we claimed that said design and manufacturing defects associated with the Fly-By-Wire flight control system of the A320 aircraft, in addition to other possible causes, contributed to the loss of SA (situational awareness) of the pilots which was the actual cause of the Armavia 967 crash. This case is still under process.